If you have a sensitive gut you may find eating garlic difficult. It is high in a type of FODMAP known as fructan which is not absorbed in the small intestine and is fermented further down in the gut. This can cause symptoms. Some people find eating a little garlic tolerable – maybe because the chain length of the fructan chain is longer than most FODMAPS, and it is fermented more slowly, but others find it a problem. The good news is wild garlic is in season across the UK and most people should be able to tolerate that. Hedgerows and woods are covered in a carpet of green spathe like leaves which are beautiful to eat when they are young and tender. They can be chopped raw in salads or included in cooking dishes like pasta , fish, stews and soups. It is also lovely as a replacement for basil in pesto. Just remember to wash them before using because they grow close to the ground. Potatoes are a great source of carbohydrate and fibre and they are low in FODMAPS so you can eat them. But they need flavour. 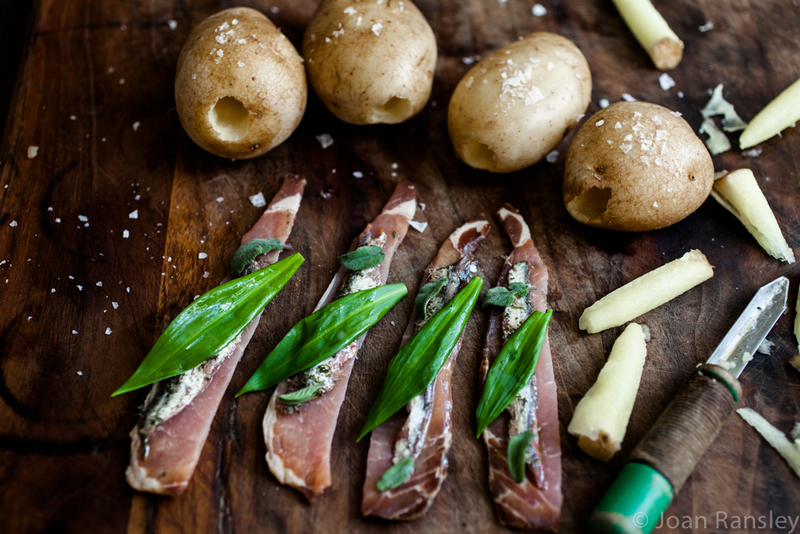 These potatoes are hollowed out and stuffed with good quality dry cured bacon, anchovies, sage and wild garlic. They are delicious and would be lovely with a stew. I think they need some moisture to soak in a bit. Preheat the oven to 200C/400F/gas 6. Gauge a hole in the middle of each potato with a potato peeler or apple corer. Lay a strip of bacon on a chopping board, place an anchovy on top and strip of garlic on top of that. 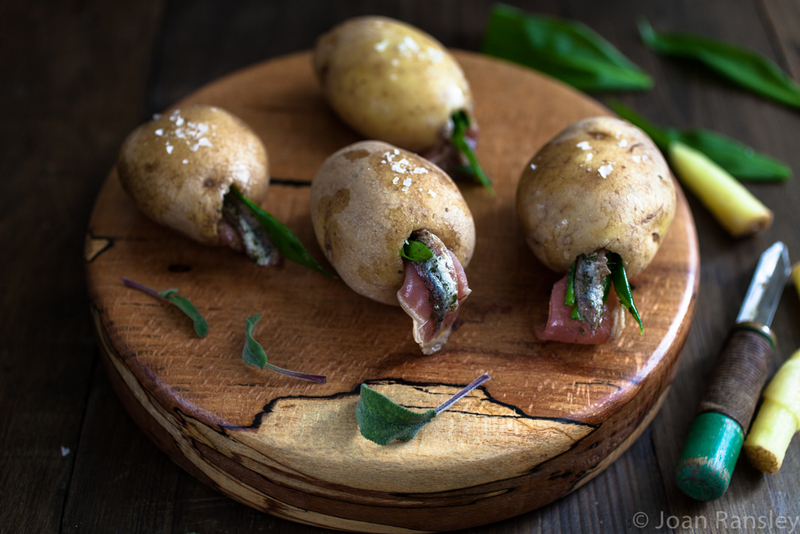 Pack the bacon, anchovy and wild garlic into the hole in the centre of the potato. Tuck in the sage leaves and put a ‘plug’ made from the potato debris created when you gauged the hole. Scatter flaked sea salt over the potatoes. Dampen the skin of the potatoes slightly to ensure the salt sticks. Place the potatoes on a roasting tray and cook for up to an hour. At 45 minutes check to see if the skins are crisp and the centre of the potato is soft. To serve the potatoes as a main meal you might like to cook a little more bacon to scatter over and serve with a grated celariac salad. 23 Mar	This entry was written by Joan Ransley and published on March 23, 2015 at 10:42 pm. It’s filed under Basic methods, Dinner, Side dish and tagged Allergy & Free From show, IBS Network, low lactose, LowFodMap, potatoes. Bookmark the permalink. Follow any comments here with the RSS feed for this post.